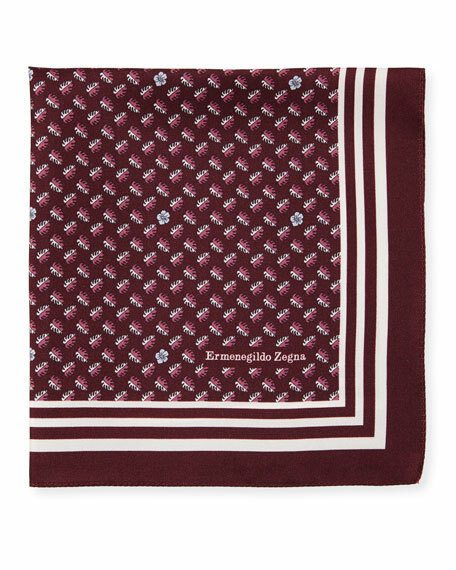 Ermenegildo Zegna pocket square with small leaves pattern. Brioni pocket square in chambray paisley. Wide, solid border. Hand-rolled edges. Cotton; dry clean. Made in Italy. Eton pocket square featuring painted floral print. Hand-rolled edges. Linen/silk; dry clean. Made in Italy. Stefano Ricci arrow print tie set. Includes tie and pocket square. Approx. 3.5" at widest. Presented in a gift box. Stefano Ricci arrow print tie set. Includes tie and pocket square. Approx. 3.5" at widest. Presented in a gift box. Silk; dry clean. Made in Italy.